Born 24 July 1900, Auchterarder, Scotland. The founder of organic crystallography. John Monteath Robertson ("JM") was a pioneer in the field of X-ray crystallography and the founder of organic crystallography. (John) Monteath Robertson (1900-1989) was a graduate of the University who was Gardiner Professor of Chemistry, 1942 to 1970, and Director of Laboratories from 1955. 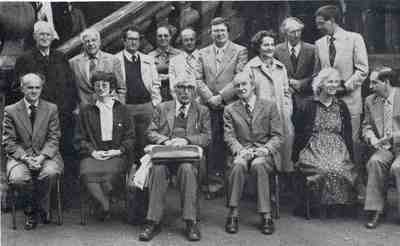 In 1989 his widow opened the JM Robertson Protein Crystallography Laboratory in the Chemistry Department. Born on a farm near Auchterarder, Robertson matriculated to study at the University in 1919 and graduated BSc (1923), MA (1925), PhD (1926) and DSc (1933). He worked at the Royal Institution from 1926 to 1928 and spent two years in the USA on a Commonwealth Fellow Scholarship before returning to the RI. 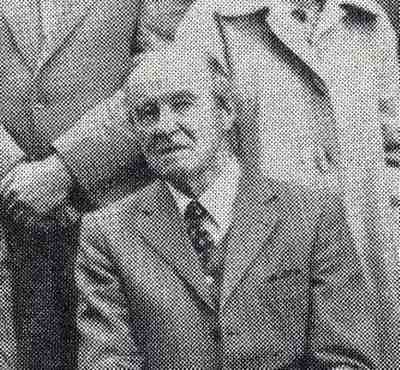 He was appointed Senior Lecturer in Physical Chemistry at the University of Sheffield in 1939. After the Second World War, during which he was employed as a scientific advisor to the RAF, Robertson was a key figure in the development of the University's reputation as a centre of excellence in Chemistry. He was best known as a pioneer of X-ray crystallography and the founder of organic crystallography, playing a significant role in the development of heavy-atom and isomorphous-replacement methods for solving the phase problem in chemical crystallography. In 1960 his research group mapped the structure of limonin. Robertson was awarded a CBE in 1962. 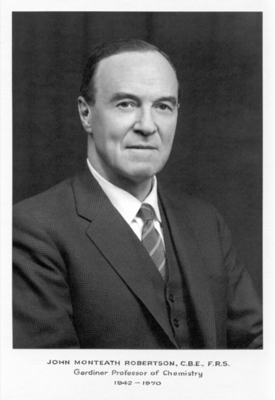 He was awarded several prestigious awards for his work, including the Davy Medal by the Royal Society in 1960 and, among several positions on academic bodies, he was President of the Chemical Society from 1962 to 1964.